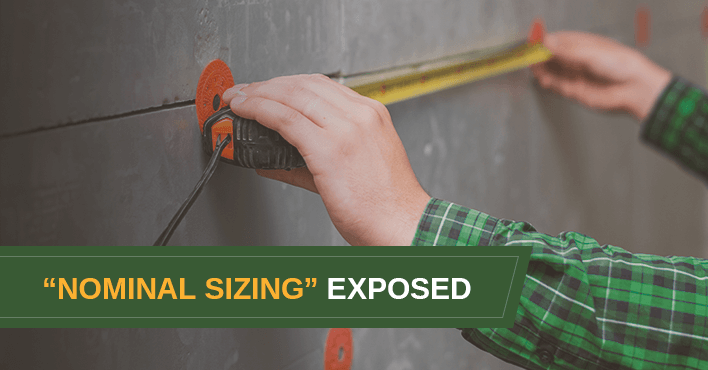 Shed Nominal Sizing (aka Nominal Dimensions) - Exposed! We’ve been in the shed game for 22 years and counting, and there are a few common practices that would beggar belief, if we hadn’t seen them with our own eyes. One of these practices is “nominal sizing” or “nominal dimensions” – which is basically another word for “approximate sizing”. We feel nominal sizing is misleading and causes many shed buyers to be disappointed because they simply don’t get the shed they thought they were getting. For example, you may see a double garage advertised as 6m x 6m. But when you drive your car into your new shed and feel it’s a bit small, you’re not just imagining things. Your tape measure verifies your shed is actually only 5.72m x 5.72m. We once measured a “9m x 6m” shed at just 8.4m x 5.8m. No wonder that customer was unhappy. A 9m x 6m shed has an area of 54 m2, but an 8.4m x 5.8m shed only has an area of 48.72 m2. That’s over 5 square metres of floor space that just evaporated – space that could have housed some cupboards, a set of shelves, or a work bench. So before you invest in any shed, be sure to ask if the sizing is accurate, or merely nominal. For the record, we only ever refer to accurate sizing. Your Designer Shed will be the exact size you order – right down to the millimetre. To discuss your next shed project, get in touch for a Free Design & Quote.